JACKSONVILLE, Fla. (Nov. 3, 2016) – New data shows wounded warriors face a greater need for help from veterans service organizations, the government, and their communities than ever before. 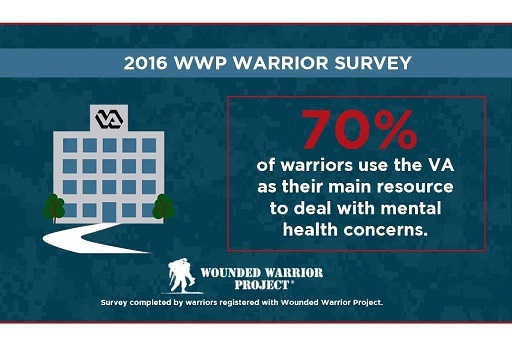 While there is improvement in some areas, according to an annual survey by Wounded Warrior Project® (WWP), warriors still face significant challenges in physical and mental health, access to quality care, and employment. More than 31,000 warriors registered with WWP completed the 2016 WWP Annual Warrior Survey, making this one of the largest annual collections of data about this generation of wounded veterans. Among the key discoveries, just more than three out of four (76.7 percent) wounded veterans registered with WWP who responded to the survey reported they live with post-traumatic stress disorder (PTSD). More than half (53.3 percent) visited a professional to seek help with stress, emotions, alcohol, drugs, or family problems. More than one-third (34.8 percent) had difficulty getting access to mental health care, put off getting care, or felt they did not get the care they needed for a variety of reasons. “There is a constant need for me to prove my injuries exist, and they are a huge problem that I often have to deal with myself,” one female warrior commented at the end of the survey. This year, WWP strengthened its commitment to providing mental health programs and services including Project Odyssey, a multi-day rehabilitative mental health workshop to connect warriors with the coping tools they need to face daily stressors, and with collaborations like the Warrior Care Network™, which treats injured veterans through intensive outpatient programs. Warrior Care Network is an innovative and collaborative approach to mental health care. WWP, the VA, and four top academic medical centers: Emory Healthcare’s Veterans Program; Rush University’s Road Home; UCLA Health’s Operation Mend; and Home Base, a Red Sox Foundation and Massachusetts General Hospital Program joined forces to ensure continuous care for veterans. WWP provides all programs and services to warriors, their families, and their caregivers at no cost, thanks to the generous donations of the American public. “It is amazing to connect with the resources and other warriors to help develop that support system,” one warrior said in the survey. WWP prioritizes connecting warriors with each other and their communities. More than half of survey responders (51.7 percent) talked with fellow Operation Enduring Freedom, Operation Iraqi Freedom, or Operation New Dawn veterans to address their mental health issues. The only resource that survey responders used more often than speaking with fellow veterans was VA Medical Centers (69.1 percent), which demonstrates marked improvements in services provided by the VA.
Employment is another issue facing wounded veterans. The unemployment rate for non-active duty respondents was reported at 15.6 percent. (National unemployment rate is 5 percent for everyone, including non-veterans). WWP offers career counseling, resume assistance, mock interviews, and networking help for warriors looking for work or just looking to change careers. The survey shows progress in several areas including education and benefits. More than three in ten (30.2 percent) have earned a bachelor’s degree or higher (26.5 percent in 2015). More than eight in ten (84.8 percent) received VA disability benefits in 2016 (78.5 percent in 2015), signaling more approved claims by the VA. Also of note, more warriors registered with WWP having retired or separated from the military. One in ten (9.5 percent) remains active duty, down from nearly 16 percent last year. While efforts of WWP and other veterans service organizations make a powerful positive impact, these survey results indicate the need remains great, and it is growing. That is why WWP and other nonprofit organizations, now more than ever, must work together to create the largest impact across communities where warriors settle after service in our armed forces. See the full survey at woundedwarriorproject.org/survey.